Welcome to Elsa's favorite spot in Arendelle, where your little dreamer can help her make frosty treats! The Arendelle Treat Shoppe set features Elsa in her Coronation Day gown, which includes a removable skirt, peplum, bodice, and cape. The set also features a pretend-snow-cone-making station, a cooler to store accessories, and little ice block seats where Elsa can sit and eat treats. Your little princess will have so much fun decorating her Frozen character with mix-and-match Snap-ins and outfits (sold separately). 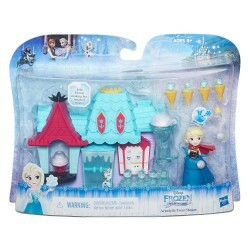 • Includes playset, doll, bodice, peplum, skirt, cape, 4 Snap-ins, and 8 accessories.